It’s occurred to me, now that I’m severely entrenched in what can only be called my own personal middle-ages, that I seem to have amassed a body of experiences that have weathered the test of time and biology and, still to this day, resonate with me. In short, these are the moments that my brain has somehow decided are important to me and that I’ve hung on to over the years. 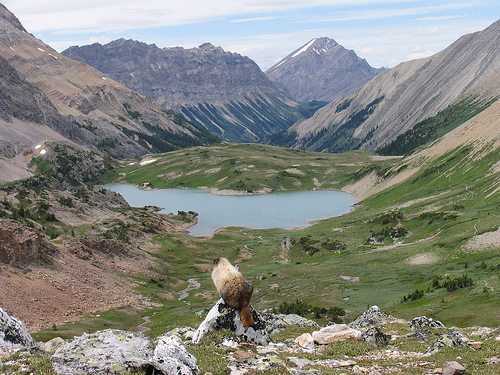 …It’s cresting Pulsatilla Pass, on the Sawback trail between Banff and Lake Louise, the just revealed view of the valley below making what seemed like hours of hiking upward disappear. …It’s an impromptu table drumming version of the Pogue’s “Sally MacLennane” (“I’m sad to say I must be on my way”) in a public house on Edinburgh’s Cowgate with newly made friends. …It’s sea kayaking the calm waters of Florida’s Ten Thousand Islands, and seeing a fin break the surface, much closer than you’d like (but not close enough to overshadow the giant sea turtles and dolphins you saw earlier in the trip), and neither you nor your seafaring companion knowing what to do aside from keep on paddling. …It’s the perfect meal of fresh cheese, bread, mustard (hands down the ultimate condiment) and whatever vegetables we could find… on a backpack table day after glorious day. …It’s hearing the Rheostatics for the first time and realizing that there really were no limits to music. …It’s bouncing along in the back of a pickup truck in Bali’s north shore and realizing, after speaking with the young man who offered the lift, that despite living so far apart in so many ways, we were pretty much the same. …It’s making sweet potato and ricotta ravioli in pesto from scratch…and getting so excited that you made your friends cancel dinner plans so they, with those they had made plans with, could come over to share. …It’s heading out on the South African veld and having my breath, literally, taken away at the first animals spotted…a group of giraffes lazily munching on tree-top leaves. …It’s sitting in the backyard on a warm spring evening, dog on lap, sipping Campari and soda (with a dash of lemon), watching not one, but two families of racoons feast on the neighbour’s mulberry tree. …It’s saying hello to your children for the first time…and goodbye to loved ones for the last time. …It’s that rare perfect wrist shot, top corner, over the goalie’s shoulder. …It’s spending hours stirring a giant pot of fresh tomato “sugo”, complete with canoe paddle spoon and frilly apron (a picture that will hopefully not be seen beyond your imagination) so that the perfect bowl of pasta can be enjoyed year round. …It’s dancing to the Weakerthans (“Memory will rust and erode into lists”) with your toddlers…then a few years later belting out Vampire Weekend (“The gloves are off, the wisdom teeth are out”) together. And it’s occurred to me that these memories, in addition to coming with a soundtrack and a menu, have a theme running through them. Sure, the exact details are a bit foggy (or outright wrong according to the research, and the Weakerthans), but what’s stuck with me most is the feeling of those moments. And while I’m not bold enough to claim any sort of wisdom (aside from “righty tighty, lefty loosie”, which is indispensable in the world of pre-fabricated self-assembled furniture), when I reflect back on those feelings it helps me realize what’s important to me (people, places), and where I want to spend my time and efforts. Happy New Year, UHN…Happy New Year. There’s a commitment to the future every time that we love somebody.